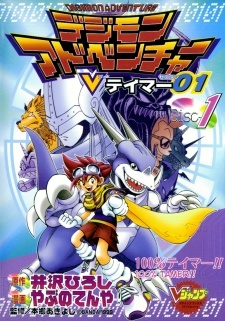 In this universe, Taichi is involved in a V-Pet tournament, where he is told he cannot play because the Digimon in his V-Pet isn't recognized as being a real Digimon; however, after the tournament is over, Taichi plays the winner of the tournament, a boy named Neo Saiba, and their battle ends in a tie—something that is supposed to be impossible. Later, Taichi is summoned to the Digital World by a digimon called Lord HolyAngemon, and there he meets the mysterious Digimon in his V-Pet, Zeromaru the Veedramon. It's fun to see an well-known character from the original series; Digimon: Digital Monster (aka Digimon Adventure), being thrown into a different setting and story line. The story's pretty basic, you have a chosen one and a enemy with their evil plans to destroy/take over the world (in this case, both worlds). Nothing new here. Although there are some sidequests which will be done, nothing amazing, but still fun to read, so instead of an fair story, I think it's a rather good (basic) story. The art itself is so-so, very enjoyable for the younger generation, and yet it can attract the older generations. The characters are pretty basic too, Taichi (from the original series), is still the same, a basic shounen protoganist, the other characters are nothing but basics too, the shy girl which turns out to be a great help, the bad guys who turn good, the bad guy who used to be good etc.etc. As this series actually brings NOTHING new at all, it's highly enjoyable for the younger generation, and for the older one's, who like shounens like Digimon. This is a must read for anyone who is a fan of the Digimon anime. Although the story is not as deep as the anime the presentation of the characters is very interesting in contrast. In the anime the protagonists hide their inner problems behind smiles and must face them later in the series. In the manga the protagonist never has any personal conflicts, but that character development is found in the antagonists. The antagonists' conflicts are remarkably similar to those of the protagonists of the anime, and they seem to be what the protagonists of the anime would become had they not overcome their troubles. It is nice to have a Digimon story with antagonists that are actually interesting. If you were not impressed by previous Digimon things this is not going to change your mind, nor is it the best entry point for the series, but it is definitally great if you enjoy the Digimon franchise. Digimon is a beloved franchise that has spanned many years and several series. But just like every franchise that's lasted this long, there are a collection of juicy little facts few people know. Here are twenty of the most interesting facts of the Digimon franchise.